Rather than being one massive entity, the Internet is actually composed of a variety of media and how we use them influences outcomes. Not only does use of the Internet for information as opposed to entertainment affect interactions and behaviors, there are differences when you look at specific areas within information or entertainment media too. One example can be seen in online gaming research that specifically contrasts social capital outcomes in MMOGs with high- and low-level social interaction. Research was done comparing World of Warcraft and Asheronâ€™s Call 2 (Williams, 2006; Williams, Ducheneaut, et al., 2006). Both games were fantasy based and designed to support, even require, social interaction within game play. The difference between the two was how many players were available to build teams in the game. While World of Warcraft was an international success with close to 12 million players, Asheronâ€™s Call 2 had so few players that those who did play the game were spread out and it was difficult to connect into communities. 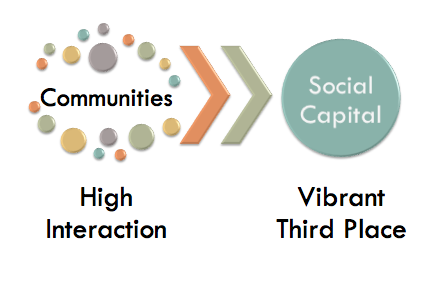 Results showed that while the game with high social interaction was a â€œvibrant third placeâ€ where social capital was created (Williams, Ducheneaut, et al., 2006, p. 340), the game with low social interaction generally showed declines in social capital (Williams, 2006). These findings fit with the theory in sense of community research that every community is unique — making it important to note characteristics of communities that could have an influence on members. Williams, D. (2006). Groups and goblins: The social and civic impact of an online game. Journal of Broadcasting & Electronic Media, 50(4), 651-670. Retrieved January 30, 2011, from informaworld. Williams, D., Ducheneaut, N., Xiong, L., Zhang, Y., Yee, N., & Nickell, E. (2006). From tree house to barracks: The social life of guilds in World of Warcraft. Games and Culture, 1, 338-361. Retrieved March 15, 2010, from Sage Full-Text Collection.